The Citizens’ Constitutional Forum (CCF) wish to commend voters of Fiji for exercising their constitutional rights by braving the rain and logistical challenges to cast their ballots during what appeared to be one of the country’s most divisive election period. The resurgence of the past was evident during the campaigning period by various political parties and candidates, in which some were demonized and aggressive/threatening statements were made publically that created a sense of instability. 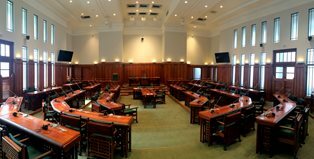 During the opening of Parliament after the 2018 Fiji General Elections, the nation watched from various mediums as elements of past politics crept into the maiden speeches presented in the August House by Honorable Members of Parliament, which were met by objective comments hurled across the room. The CCF wish to remind those who have been entrusted by the people, to represent the people, to focus their energy and attention on the needs of the people rather than dwell on the past. CCF Chief Executive Officer, Sara Bulutani Mataitawakilai states that CCF believes that people need more than a look back in history, as it is starting to sound more cliché’. “We want to see our leaders move away from the past and take us forward with constructive debates that will give justice to the votes that put them in those seats”, said Mataitawakilai. “It would be great to see constructive discussion and debates around Bills that spark intellectual enthusiasm”. “CCF looks forward to the next Parliament sitting on 11th February. We stand by a government that adheres to democratic practices and delivers results that will benefit Fiji and her people over the next four years”, added Mataitawakilai. It is our hope that Fiji will be free from politics of fear, race and religion which will allow emerging and future leaders to honestly embrace unity in our diversity. This needs to be a cultivated, and nurtured value and not just talk.